The Finished Outline: I file or rasp right to the inside of the line I marked using the washer, except in the corner areas. There's a crossbar near the floor under my bench that's spaced just right so that if I put my foot on it, I can clamp the plate with my knee up against the bottom of my bench top for filing. A Finished Corner: Much of the character and personality of the outline comes from the shape of the corners. Each corner should look like the others. The pen line is a starting point, but the eye is the final judge. Final Edge Thickness: Often I use a rotary file in my drill press, but I don't just use what the tool gives me. I use different thicknesses in different areas of the plate to create an impression of movement and a logical relationship between the edge and the rest of the violin; this is executed by hand after machining the basic contour. It's almost as easy to cut the edge thickness with the hand purfling cutter used for the initial marking, and sometimes I do it that way. An Edge with Life: The edge is thickest at the ends of the corners, and varies in other places as well. 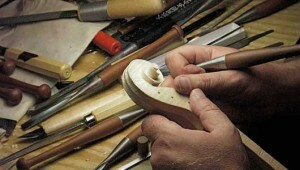 Routing the Purfling Groove: I use a small machine I made myself. Knifework in the Corner: The corners are finished with a knife, by hand; then the purfling, bent by heat just as the ribs were, is fitted and glued into the grooves. Fitting the Purfling: Where they meet at the corner, the strips of purfling are trimmed with a knife to mitered points that fit together gracefully without gaps. Here, where the end has been cut diagonally through the strip, you can see all three layers exposed. Purfling is set about 2mm deep into the edge to allow for what will be removed later, cutting the scoop. That leaves about 2mm of wood underneath the purfling to connect the edge to the rest of the back. The Finished Arch: At this point, the entire outside of the back is finished. The final arching gets planed and scraped, and the edge carefully worked by scraping, until the scoop over the purfling is clean and finished. Scraping the Scoop: Everything inside the crest of the edge can be finished ath this point, except for the clean-up scraping the whole body will get once it's assembled. However, I leave rounding the outside of the edge until later so that it doesn't get battered. Graduating the Back: All the extra wood is removed from the inside of the plate using gouges and finger planes and finally, by scraping. Measuring Graduation: A normal violin or viola back measures about 4.5mm thick in the center, and half that just inside the outer edge. The exact numbers aren't too important, but the distribution of weight in the back has a huge effect on the tone and response. Everything outside the line I've drawn around the edge will be left flat as a surface for gluing on the ribs.